Wales! That little country tacked onto the side of England… we were only there a short time, and didn’t really get to explore much. However, what we saw was interesting. Most of these pictures were taken at a pretty little park, where we walked around a bit. Our other destinations in Cardiff were a souvenir gift shop, a book store, a thrift store, and a fast food chicken place. At the thrift store I was tempted to buy a bunch of interesting books on the Welsh language, but I maintained my self-control, reasoning that it would be very unlikely for me to return to Wales anytime soon in the future. As for the chicken place, well… we were hungry, and our options were limited. My memories from the chicken place were that if you wanted ketchup, you had to pay extra, and we were practically the only white people in the restaurant, everyone else looking middle-eastern! So much for traditional Welsh food. Maybe one of these days I will make it back to Wales. I’m sure there’s much more to see than I was able to breeze through on my short visit! I was first introduced to Ceredwen when I discovered one of their CDs at the library, and I checked it out to see what it was. I do not do this often; in fact, it was probably because I saw that the songs were in Welsh that I decided to get the CD. 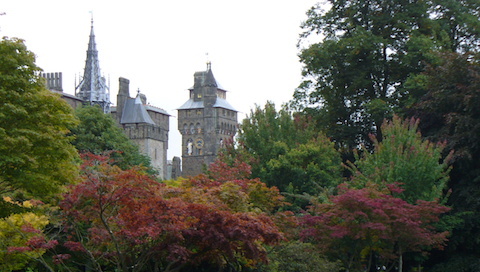 Ceredwen is made up of two people, Renée Gray (Welsh) and Andrew Fryer (English). As mentioned, all of their songs are sung in Welsh, which I enjoy even though I understand not a word of it. It is sprinkled with voiceless velar fricatives and voiceless alveolar lateral fricatives, which give it a very interesting sound. The lyrics are all based on either Welsh mythology or history, and the notes included with the CDs give translations and detailed explanations for each of the songs. These are not folk songs, but neither are they popular or love songs. They are songs such as a bard would sing—ballads of things past, both fantastic and real. The compositions are very well done. Many of the tunes are quite catchy, and you may get them stuck in your head if you’re not careful. After listening to it a few times, you may find yourself humming the tunes and wishing you could sing in Welsh. Renée Gray has a very nice voice (I would liken it to Mairéad Ní Mhaonaigh‘s), and many of the songs introduce a vocal part alone, then adding it to the main melody later on in the song. The musical texture of most of the songs is quite complex and interesting. I have read that Ceredwen would appeal to fans of Clannad, Enya, and Moya Brennan, and I suppose that would likely be true. However, their style is quite a bit different. The instrumentation is very electronic, more so than Clannad. In this respect, the sound of Ceredwen would be more akin to Enya, although theirs is much more upbeat, and the synthesized sounds are not used quite as tastily as in Enya’s music. Not all of Ceredwen’s instrumentation is synthetic, however. Andrew Fryer incorporated penny whistle, flute, bodhrán, and uilleann pipes, although he sampled these “for better control,” and they end up sounding not-quite-authentic in the recordings. Thus, I would say that Ceredwen’s sound is not as crisp as Clannad, nor as professional-sounding, but it is still very good. 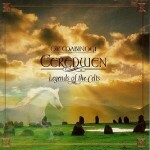 So, if you like Celtic music, I would advise that you give Ceredwen a listen. You may like it, or you may not. It grew on me, as I checked out the CD from the library a second time and then finally gave in and bought it (as well as their other CD).